Enticer is the very best example of the extremely popular 4087 3 stateroom, aft cabin, Cockpit M/Y. Not another one out there for sale with the hardtop. She's an up north boat recently brought to Florida. Enticer is loaded with newer generator, canvas, Cummin's Diesels with very low hours and has been very well cared for and updated. If you're looking for a sundeck trawler or motor yacht you need to give this 4087 a look. Better layout and a lot more room with a cockpit for a 40 foot. A Must See!!! United Yacht Sales New Jersey would love to guide you through a personal showing of this 39' Bayliner 4087 Diesel Cpmy With Hardtop 1997. 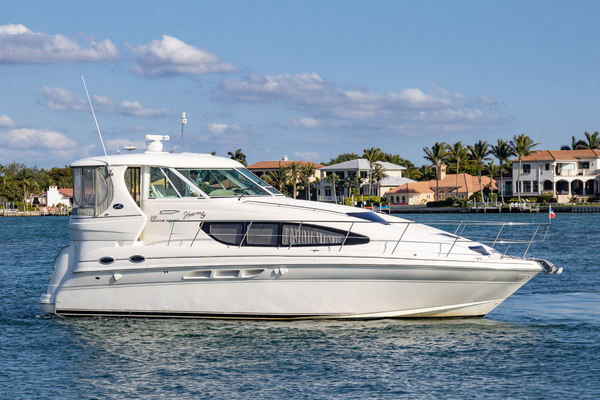 This yacht for sale is located in Cocoa Beach, Florida and priced at $79,000. For a showing please contact us by filling out the form on this page and we will get back to you shortly! Forward is a guest stateroom with a double berth offset to starboard, night table with stowage and a bench seat. Aft to port is a midship stateroom accessible from the passageway or forward stateroom with a double berth and hanging locker. To starboard is a guest head with shower. Aft up steps into the main salon is the lower helm to starboard and a raised dinette (converts to a double berth) to port. Following aft to port is a U-shaped galley with a straight settee flush to starboard and an entertainment cabinet. Moving aft into the master stateroom is a double island berth with a night table, hanging locker, cabinet and an ensuite head to port with a vanity separating a private shower. You will be impressed with the care that this boat has had and the layout, she is a pleasure to show and with all of her added equipment a great value.